Instead, our late rent lists are lined with those we call our ‘serial late rent offenders’, being those that are constantly behind in their payment time and time again! If it’s not one excuse it’s another and another, and then another again! And at Christmas time their excuse will be ‘they had to spend their money on Christmas presents’! Your ‘serial offenders’ are more likely to be evicted than anyone else at Christmas time, so you need to act before they get behind in payments! Some time ago I came across an article in the ‘Adelaide Advertiser’ that reported how the police at this time of year go and visit known arsonists and tell them they are being watched during bushfire season. If these people get the perception that the police are ‘watching their every move’ they will be less likely to offend and cause destructive damage. Relating back to property management when we evict a tenant untold damage is also caused. It’s like ‘bushfire season’ and your ‘arsonists’ are your late rent serial offenders! Usually, a bond may be exhausted with outstanding rent and then on top of this all the work to clean the property up. An eviction can take anywhere up to 32 hours of work! In our Zero Tolerance Rent Control training sessions we sometimes conduct a time and motion study with an eviction. From the first serving of paperwork to travelling to and from the property (to see if the tenant is still in possession) to tribunal/court attendance. Then also all the liaising with the owner and tenant many times over to the eventual eviction, messy final inspection and dealing with all the clean-up and tradespeople, the extra travelling time and Landlord Insurance claims we have calculated this all up to be a maximum of 32 hours worth of work. Then also ADD the stress, exhaustion and burnout! The average hours in a 12 month ‘normal tenancy’ with a tenant moving in and out is around 20 hours alone. An eviction is FAR more than that in hours spent and your agency is likely not getting paid for it either! And when you’re too tolerant, polite and a polished ‘professional’ this can result in more evictions whereas a tough-line approach may upset them at first but at least it might shock them into paying their rent and avoid eviction. This is a much better and more acceptable outcome! Do everything within your power to stop an eviction! So why wouldn’t you do everything within your power to reduce this problem with your known rent arrears ‘arsonists’ in the coming Christmas season where more evictions happen than any other time of the year? 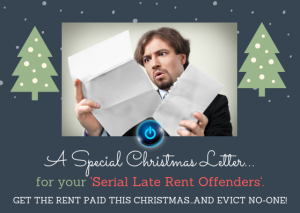 So consider identifying who your regular late rent payers are (the hard-core ones only please) and simply send them a letter outlining your concerns at Christmas time. These are your tenants where nothing else seems to be effective in getting the message through. State clearly it is important that they do everything to ensure their income is prioritised in paying their rent on time all the time. This letter might seem ‘in your face’ but it should press home the point over Christmas that paying the rent on time is still the most important payment they have to make. End of November to mid-December is a great time to send this letter. All the best in winning the battle during ‘eviction season’ and keeping ALL your tenants and their families in accommodation because at the end of the day that’s what it’s all about! DISCLAIMER- Amend and tailor for your use and send this to your known regular late rent offenders. ONLY use on those tenants that have a regular history of NOT wanting to pay their rent on time, where other methods haven’t been effective. Those that really frustrate you! Ensure your manager is aware of you using this letter before served on selected tenants, as you WILL get complaints using this letter!